Delaware County District Attorney Katayoun Copeland joined an event recognizing grandparents who have become caregivers as a result of the heroin and opioid epidemic. The gathering was held in front of the courthouse in Media in February 2019. More than 40 cases against opioid makers are pending there. In the 18 months since Delaware County became the first county in Pennsylvania to sue opioid makers, it has become the statewide center for litigation against the manufacturers and distributors of opioids. More than 40 suits across the state – including complaints filed by Philadelphia city government and District Attorney Larry Krasner – have been corralled in the county courthouse in Media, where litigants didn’t have a digital system to file documents until mid-2018. Filing motions and briefs on paper, and in person, has been but one bump in the road. The suits are on their third Delco judge. Counties are still vying for spots on the leadership team overseeing the cases. Philadelphia lost its own leadership role after a law firm’s potential conflict of interest came to light. And drug companies have yet to turn over any internal documents. Delaware County’s original case isn’t even in Delco anymore – it is now in federal court in Philadelphia, after one of the corporate defendants argued it should be moved to the federal level. The county’s hired lawyers are fighting to be returned to local court. Pennsylvania’s death rate from drug overdoses was nearly double the national average in 2017, according to the DEA. And across the country, counties, towns, and other groups see lawsuits as their best chance to recoup the costs of attending to an epidemic that killed 47,600 people in 2017. Pharmaceutical companies are vigorously defending against allegations that they misled the public about the risk of addiction, and failed to monitor the flow of pills. In Pennsylvania, depending on which lawyers you ask, that legal process is either going about as well as one could expect given the complexity of a nationwide court battle – or it is in disarray. “It’s an unfortunate, sad situation for the people of this commonwealth,” said Donald Haviland, whose firm represents Lehigh County District Attorney James Martin, one of the plaintiffs suing drug companies. “We’re falling way behind.” Lehigh’s own trial date, he says, has been derailed. Lehigh is one of several plaintiffs looking for an exit from the courthouse in Media. “We’re trying to get ourselves out of the vortex that is Delaware County,” Haviland said. Lehigh’s objection is pending. Separately, SEPTA and three labor unions, including Philly teachers, have appealed to state superior court to leave as well. Delco’s attorneys say coordinating the cases in one place – and putting them in charge – is intended to be cost effective and efficient, and to avoid conflicting results in different courts. At the federal level, hundreds of cases are grouped together in Cleveland, a high-profile proceeding that’s drawn comparisons to the tobacco settlement in the late 1990s. “What we are dealing with is the largest and most complex piece of litigation in the history of the United States,” said Paul Hanly, who is co-lead counsel for the Delco cases, along with the consolidated suits in Cleveland, and state-level suits in New York and Illinois. Communities around the country have brought more than 2,000 cases, he said. Delaware County Council Chairman John McBlain and District Attorney Katayoun Copeland declined to comment on the suit. As for the court’s experience with large lawsuits, the county “successfully dealt with the asbestos litigation in the 1980s and 1990s," spokesperson Adrienne Marofsky said. Delaware County officials announced the filing of a lawsuit against makers of opioid painkillers in September 2017. Trial dates for opioid cases are looming in other states, such as Oklahoma, where jurors will be first to hear a case in May. For the federal cases in Cleveland, a judge has designated bellwether trials to start in October. Lehigh County had a court-ordered trial date, too. 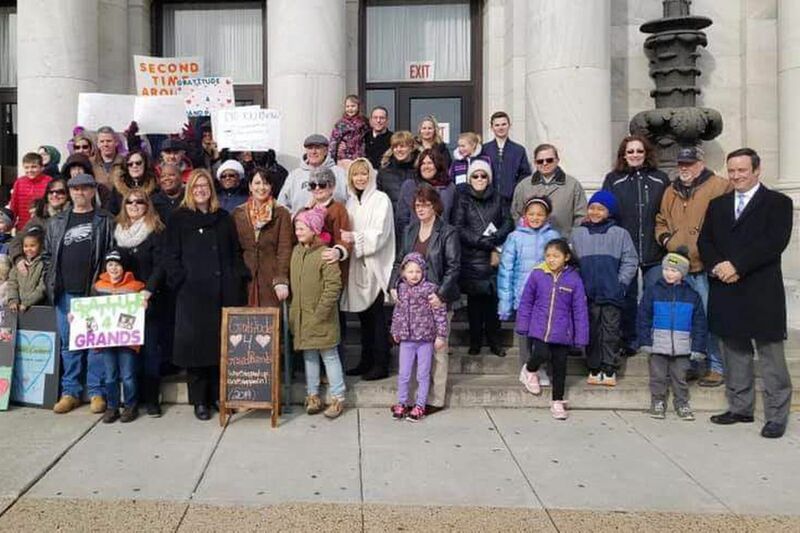 Last summer, a judge hammered out deadlines that would have put the county’s case in front of an Allentown jury in March 2020. But now that schedule for a courtroom showdown is shot. Tobias Millrood, another co-lead counsel who reps Delaware County, said his team’s “only financial motive here is to hold the defendants accountable for their wrongdoing and make sure that Pennsylvanians are compensated” – including Lehigh County. Other firms “do not have the track record or the experience to run this type of litigation,” Hanly said. His firm provided evidence in a 2007 Department of Justice case, in which the opioid maker Purdue Pharma pleaded guilty to a criminal charge in Virginia and agreed to pay more than $600 million. (Purdue’s CEO said last week that the firm is considering bankruptcy due to its potential liability from the opioid suits.) Now, Hanly pointed out, four judges in four jurisdictions have concluded he should be in a leadership role managing the opioid cases. State attorneys general are working their own cases and investigations. Pennsylvania Attorney General Josh Shapiro has been investigating drug manufacturers and distributors since late 2017. He’s among a minority of state AGs who have not filed a lawsuit against drug companies – about three dozen others have – but he is a leader in a coalition of more than 40 attorneys general negotiating through the federal court in Cleveland. “Should those negotiations reach a point requiring additional legal steps, our office will not hesitate to take action against the pharmaceutical industry,” said spokesperson Joe Grace. Despite talk of a global settlement, a singular path to resolve the cases has yet to emerge. Some attorneys, including Haviland, say there is likely no “one size fits all” solution to end the litigation. That’s one reason why SEPTA and three unions are arguing they shouldn’t have been roped into the Delco group. As “third-party payers,” for employee health care, the organizations say they’re out of pocket the money they have spent on prescription opioids. That’s a different type of case from local governments arguing that opioids created a public nuisance and increased their costs, says Philadelphia attorney David Senoff, who represents the four groups. On appeal to state superior court, Senoff argued that his clients weren’t given a proper chance to object to the Delco transfer. He would like to see the union’s cases back in Philadelphia, where he originally filed them, and where the court has a dedicated complex litigation center, known for handling mass tort claims against pharmaceutical companies. “When we first got transferred, Delaware County didn’t have electronic filing. … We were hand delivering all of our filings to Media," he said. The Delaware County courthouse in Media, Pa.
Delaware County Judge Barry Dozor inherited the cases in January, taking over from one predecessor who was facing mandatory retirement, and another who was reassigned to criminal court. At the time, the city and Krasner hadn’t named the distributors as defendants, but other plaintiffs had. Berger Montague, in court papers, said it did not believe it was “conflicted” from continuing to serve as co-lead counsel – but would agree to relinquish the post. The same day that Berger filed its withdrawal in November Krasner’s office brought an amended lawsuit, this time including the three drug distributors as defendants. Krasner has asked the court to appoint another one of the city’s hired firms, Dilworth Paxson, to a leadership role. The District Attorney’s Office declined further comment. Looking ahead, Delco’s attorneys say they’re eager to get on with discovery, once they have a court order in place. They also acknowledge that their own suit could be shipped from federal court in Philadelphia, to join the other federal opioid suits in Ohio.